A few years ago I compiled a mega-list of shows to watch if you love Downton Abbey, and it’s been really popular. Now that Downton is over (I can hardly believe it! ), I decided to pull together a new list covering more period pieces, British TV shows, and other great movies with a Downton feel. If you’re sad Downton is done, you’ll want to put these shows on your must-watch list. Note: Please check the previous list for 60 more ideas, and if you know of a show I haven’t included on either list, please let me know in the comments. Also, I’ve linked to each show on Amazon so you can get more info (links are affiliate links) AND noted where you can view the shows for free, current as of post publication date (streaming availability may change). Some are on Netflix and some are available free on Amazon with a Prime Subscription, while a few are only available to rent or purchase. Most of the items listed have a TV-14 or below rating, but some items may have content that is not family-friendly, so please do your own research if that’s a concern. Enjoy! 1. A Place to Call Home: I just found out about this Australian series set in the 1950’s which is available to watch on Acorn TV. WSJ says it’s “about family secrets, religion, money and class in early-1950s rural Australia,” and calls it “instantly irresistable.” It’s apparently being called the Australian Downton Abbey – sounds worth a try! 2. Anzac Girls: Another Australian import available on Acorn TV, Anzac Girls is based on true stories of Australian and New Zealander nurses during WWI. 3. Austenland: This movie is a must-watch if you’re a Jane Austen fan. A single girl with a Darcy fixation heads off to “Austenland”, a recreation of Jane Austen’s England. If it sounds goofy, you’re right: it’s the most hilarious parody of everything you’ve come to expect from a period piece that I’ve ever seen. Seriously, I was crying laughing. This show is hilarious. Available to rent on Amazon. 4. Becoming Jane: This movie shows us Jane Austen as a young woman who dreams of writing for a living and just might be falling in love. It’s fun to see a little more about the woman behind so many of the stories we love (and it’s especially fun to hear some of the most famous lines from her books said by various characters in the movie). Available to stream on Netflix. 5. Breathless: This series, set in a London hospital in the 1960’s, tells the story of Dr. Otto Powell, a handsome obstetrician with a secret past, as well as two sisters who are both nurses in his department. It’s fascinating to see this time period; it’s amazing to see how times have changed in 50 years. Good writing and acting, enough mystery to keep you hooked, and lots of fun clothes! Available to stream free with Amazon Prime. 6. Broadchurch: This is not a period piece; rather it’s an absorbingly realistic British mystery mini-series (with two seasons now available). Set in a small British town in modern day, an 11 year old boy is murdered and detectives struggle to find his killer while his family struggles to go on without him. The writing is amazing, with plenty of twists and turns, and the acting is fantastic; it’s very, very hard not to binge watch the entire thing. Content note: contains some strong profanities and adult content. Both seasons currently available to stream on Netflix. 7. Brooklyn: This recent release tells the story of a young Irish woman who emigrates to Brooklyn in the 1950’s. The plot is a little light, but the scenery, costuming, and witty dialogue more than make up for it. It was a fun view into a different world. Available to rent on Amazon. 8. Death Comes to Pemberly: In this sequel to Pride & Prejudice, set 6 years after their marriage, Lizzy and Darcy are happily preparing for the annual ball when a corpse is found on the Pemberly grounds. You’ll see a different side of the characters you know and love as they try to figure out who the killer is. Currently available to stream on Netflix. 9. Far From the Madding Crowd: This adaptation of Thomas Hardy’s classic novel is absolutely gorgeous. The scenery, costumes, and music are just lovely. The story is a bit unusual for it’s time period in that it’s about an independent woman who, instead of searching for a husband, isn’t sure she wants to be tied down. Of course, romance is headed her way whether she wants it or not, though she travels a rocky road before being united with her true love. Available for purchase on Amazon. 10. Home Fires: This engaging Masterpiece drama follows the lives on women in a rural English village on the eve of World War II. The show does a great job depicting the variety of ways the impending war affects the women in the community. I loved it, and am hoping for a second season! Available to purchase on Amazon. 11. Poldark: If you’re going to watch one show this year, Poldark should be it! After fighting for England in the American Revolution, Ross Poldark returns home to find his father dead, his fortune vanished, and his sweetheart engaged to his cousin. And that’s just in the first ten minutes. Some moments are tragic, others are heartwarming, but the entire thing is JUST SO GOOD! I cannot wait for season 2, starting summer 2016. Available free on Amazon Prime. 12. Place of Execution: In another well-made British mystery, we get the parallel stories of an mysterious disappearance in 1963 and a filmmaker in present day who is trying to sort out the unsolved crime. The filmmaker has been interviewing the man who was the lead detective on the case way back when, until he suddenly tells her “mistakes were made” and refuses to continue talking to her. What really happened that night in 1963? Available to stream free with Amazon Prime. 13. Sherlock: A contemporary take on Arthur Conan Doyle’s classic, this BBC series takes place in present day London. These stories have been made and remade in numerous fashions in recent years, but this series is clearly the most successful. It’s smart and fast paced with plenty of intrigue and plenty of fun Sherlock/Watson repartee. All 3 seasons currently available to stream on Netflix. 14. Suffragette: This recent release tells the story of a young women who gets involved with a group of women fighting for voting rights in England in 1912. This amazing historical drama is a must-watch film: we should know what people went through to gain the rights we take for granted today. That said, it’s also a sad film that’s painful to watch at times. Honestly, I had no idea how violent this struggle became and how few rights women at the time had (the main character is thrown out by her husband and as a result has no legal right to see her son ever again!). Compelling and well acted. Available to rent on Amazon. 15. The Best Exotic Marigold Hotel: Seven elderly Brits decide to spend their retirement in India at a swanky retirement hotel. When they get there the hotel turns out to be a rundown dump. Some of the Brits adjust to life in India immediately, while others struggle. It’s a sweet, funny movie with acting that’s every bit as good as you’d expect from the famous names in the film. I haven’t seen the sequel yet, but I hope it is just as good! Available to rent from Amazon. 16. The Crimson Field: Set in a field hospital on the coast of France, this Masterpiece miniseries follows three young nurses who have come to tend the wounded during WWI. Each episode reveals more about the nurses’ pasts and current struggles, as well as giving a picture of a society caught between old rules and a new way of thinking. Available to stream on Amazon Prime. 17. The Duchess: Georgiana is thrilled to receive a proposal of marriage from the Duke of Devonshire, thinking such a brilliant marriage will guarantee her happiness. She’s quickly disillusioned, however, as her distant, philandering husband blames her for not being able to give him a son. The film paints a bleak picture of what life was like for a woman, even a privileged one, in 18th century England. Available to rent on Amazon. 18. The Escape Artist: This is another riveting mystery/drama set in present day Britain. David Tennant stars as a junior barrister who is so good at defending the accused he has earned the nickname “The Escape Artist.” When he successfully defends a serial killer, however, things get personal. This series is brilliantly written, so much that you aren’t sure of the exact truth until the very last scene. Available to stream free with Amazon Prime. 19. The Lizzie Bennet Diaries: Imagine if Lizzie Bennet lived in the present day and decided to tell her story (and that of her sisters) via a video blog, aka vlog. That’s what you get from The Lizzie Bennet Diaries, a collection of short episodes that run through the main events of Pride & Prejudice, updated for modern day. The result is smart & funny. Purchase the series on Amazon or watch it free on Youtube. 20. The Magic of Ordinary Days: This very sweet movie centers around Livvy, an educated young woman who becomes pregnant during WWII. With the father off to war and uninterested in marriage, Livvy’s father arranges a marriage to a lonely farmer in a rural area. As you could expect, the marriage doesn’t begin well, once your see how kind the new husband is you know you’ll get a happy ending. Very sweet, uplifting and clean, without being cheesy. Available for purchase on Amazon. 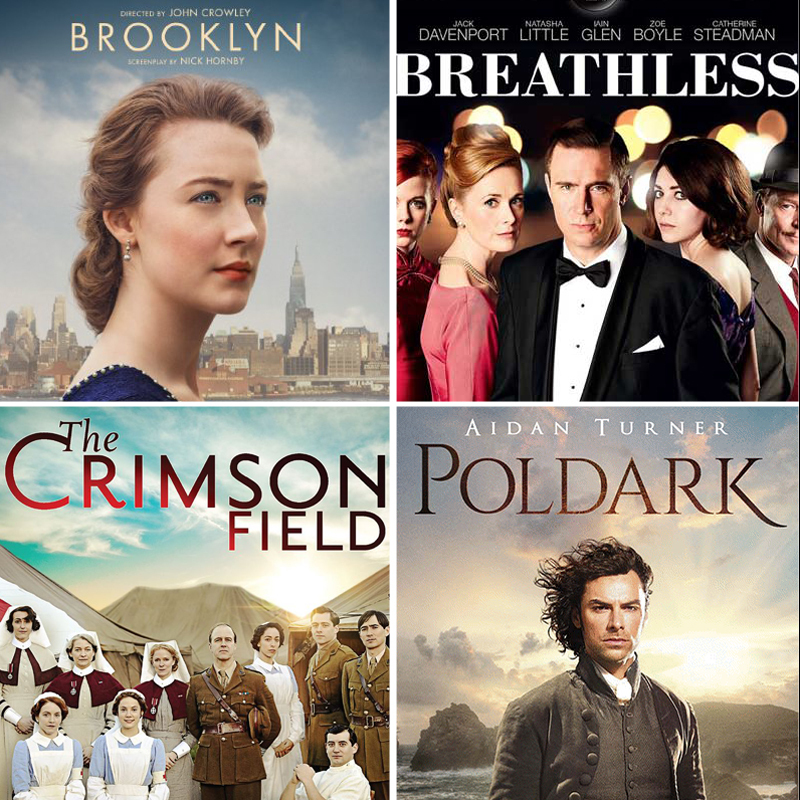 Remember, check out my first list with over 60 more TV shows, miniseries, and movies like Downton Abbey! Loved Poldark! Waiting impatiently for another season. Also liked The Crimson Field, Breathless, and Place of Execution. Thanks for other suggestions. 1. I have watched the entire series of “A Place To Call Home” on PBS. It was awesome, and I cried at the end. 2. I am a Benedict Cumberbatch fan, so I have really enjoyed Sherlock, which I also have watched on PBS. His movie, “The Imitation Game”, was nominated for an academy award. It was about Britain’s top secret project to break the German “Enigma” code, During WW2. It is based on the life of Alan Turing who broke the code and built a precursor of today’s computers. 3. Something you did not mention is the “Outlanders” series, based on the books by Diana Gabaldon. The series goes back and forth between post WW2 Great Britain and 17-18th century Scotland. 4. Masterpiece Mystery is currently showing Grantchester season 2, about a young, single, Anglican priest, who keeps getting himself into some kind of trouble. By the way, these shows are what I watch/listen to, while I am sewing. Great recommendations, I’ll be sure to check some of these out!